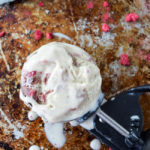 Just in time for summer: a dairy free and gluten free raspberry fudge swirl ice cream. Oh, it’s paleo and vegetarian, too! Add coconut milk to a medium pot. Slice the vanilla bean in half and add to pot. Heat the coconut milk over medium-low heat, stirring frequently, until hot and steaming but not simmering. There shouldn’t be any bubbles; if there are, reduce heat. Separate the egg yolks into a heat-proof bowl and whisk. Now it’s time to temper the egg yolks. While stirring the egg yolks constantly, add a few spoonfuls of hot coconut milk. Continue to stir until smooth – there shouldn’t be lumps of cooked egg. Now that the eggs are tempered, slowly add them to the pot, stirring constantly. Heat on medium-low, again stirring constantly and never letting the mixture simmer until it thickens, about 6-8 minutes. It should coat the back of a spoon and have the consistency of heavy cream. Remove from heat and pour into a bowl. Add honey and stir until completely combined. Let cool. Remove the vanilla bean and scrape the inside with the back of a knife. Add the vanilla seeds back into the custard and discard the pod. Chill the bowl in the fridge until cold (2+ hours). Meanwhile, prepare the raspberry fudge by combining all of the ingredients in a small bowl and stirring until smooth. Place the chilled custard in your ice cream maker and prepare according to the manufacturer’s instructions. Pour the churned ice cream into a freezer-safe container. Using a butter knife, add the raspberry fudge and swirling around the ice cream. Add additional freeze-dried raspberries if desired (or save them for garnish). Transfer the container, covered, to the freezer for at least two hours to firm up. When serving, defrost for at least 15 minutes before scooping. It will keep for a little over a week.